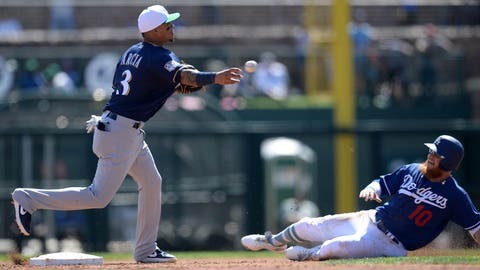 Milwaukee’s top prospect Keston Hiura came through with a clutch three-run double, and the Brewers closed out a 9-8 victory over the Los Angeles Dodgers on Sunday afternoon. Hiura’s bases-clearing double came with two outs in the top of the eighth inning and gave Milwaukee a 9-7 lead. Los Angeles jumped out in front early Sunday, claiming a 6-1 lead in the third inning. Milwaukee starting pitcher Zach Davies struggled in his appearance, allowing seven hits and six runs in 2 2/3 innings pitched. But the Brewers chipped away at the lead. Christian Yelich brought in Hernan Perez on an RBI single, and Tuffy Gosewisch hammered a two-run double in the seventh. After Clayton Andrews yielded a run in the ninth inning, left-hander Cody Beckman recorded the final out and earned his first save of spring training. Milwaukee has a day off Monday but returns to the field Tuesday against the Texas Rangers.